Who loves kickball as much as we do?! Return to your grade school roots next season and get signed up to play in the THE BEST social leagues around. 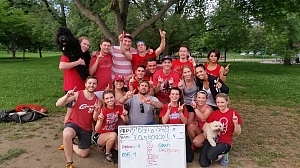 There is no better activity to help put a cap on the stressful days at work than to play kickball with friends... so don't forget the coolers! New for 2019, we're excited to announce a partnership with the City of Dublin. We will be offering 2 nights of kickball at Darree Fields this spring. 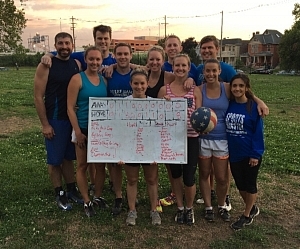 As always, Goodale Park will be our main home for Kickball for the downtown area. Registration is open for full teams or individuals looking to be placed on a team. These leagues are guaranteed to fill up fast so act quickly on your registration to reserve your spot! 7 week regular season followed by a playoff tournament.